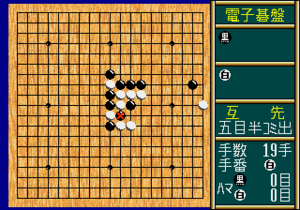 Sansan (サンサン) is an online service allowing people living in Japan to play the abstract strategy board game Go with other subscribers over the internet on a Windows PC. However, at its launch in 1994, a version for the Sega Mega Drive was also made available. This version of the game allows players who have a Sega Mega Modem to connect over a 33.3kbps or ISDN line to play other members who have a Sansan ID. However, as of 2011, there are no known Mega Drive-compatible Sansan servers. A local two-player version of the game is also included for play. 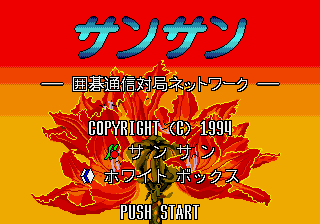 For whatever reason, the Mega Drive version did not last very long — it is one of the rarest and most sought-after Mega Drive games; Sega of Japan's official archive doesn't list it (despite Sansan Co., Ltd. having T-series code T-147) and a ROM was not dumped until February 2011. The Windows PC version of the service continues to this day. Two players, Black and White, take turns placing a stone (game piece) of their own color on a vacant point (intersection) of the grid on a Go board by pressing . Black moves first. The official grid comprises 19×19 lines. Vertically and horizontally adjacent stones of the same color form a chain (also called a string) that shares its liberties (see below) in common, cannot subsequently be subdivided, and in effect becomes a single larger stone. Only stones connected to one another by the lines on the board create a chain; stones that are diagonally adjacent are not connected. Chains may be expanded by placing additional stones on adjacent intersections, and can be connected together by placing a stone on an intersection that is adjacent to two or more chains of the same color. A vacant point adjacent to a stone is called a liberty for that stone. Stones in a chain share their liberties. A chain of stones must have at least one liberty to remain on the board. When a chain is surrounded by opposing stones so that it has no liberties, it is captured and removed from the board. Players are not allowed to make a move that returns the game to a previous position. This rule, called the ko rule (from the Japanese 劫 kō "eon"), prevents unending repetition. Instead of placing a stone, a player may pass. This usually occurs when they believe no useful moves remain. When both players pass consecutively, the game ends and is then scored.